House Speaker Nancy Pelosi announced Friday that she is leading a 12-member “bipartisan” congressional delegation to Haiti. The group includes one Republican — outmatched by 11 Democrats. Though Pelosi’s press release used the word “bipartisan” five times, Florida Sen. George LeMieux is the sole GOP lawmaker in Congress visiting the devastated island nation for what would presumably be a bipartisan cause — assessing ways to help the country recover from its earthquake. In a statement sure to rile Republicans, House Speaker Nancy Pelosi Friday dismissed calls for bipartisanship as “process” arguments extraneous to passing a stimulus bill — and warned Senate Democrats against slashing proposed increases to education spending. Pelosi — speaking to reporters on the second day of her retreat with House Democrats at a swank Williamsburg, Va., golf resort — was clearly annoyed with Senate attempts to slash up to $100 billion in spending from the $819 billion package the House passed last week. [...] “Washington seems consumed in the process argument of bipartisanship, when the rest of the country says they need this bill,” the California Democrat said, seeming to sweep aside the Obama administration initial desire to have broad GOP support for the plan. It took less than two weeks for lawmakers to vote to break new rules requiring that new spending be offset elsewhere in the budget, waiving the requirement just minutes before a strong bipartisan majority passed a $15 billion job-creation bill in the Senate on Wednesday. The bill continues highway construction and offers a payroll tax break for businesses that hire unemployed workers. Given the state of the economy, supporters said the bill was too important to hold up. "This is a good bill, it's a focused bill, it's a modest bill, but it will do some good for the hundreds of thousands and perhaps millions who are looking desperately for work," said Sen. Charles E. Schumer, New York Democrat, who crafted the payroll tax break in the bill. Who will defend their irresponsibility? The Senator who wrote the bill? President Obama signed the budgeting change into law Feb. 12 and, a day later, lectured Congress to heed the restrictions. "This rule is necessary, and that is why I am pleased that Congress fulfilled my request to restore it," he said in his weekly radio address. 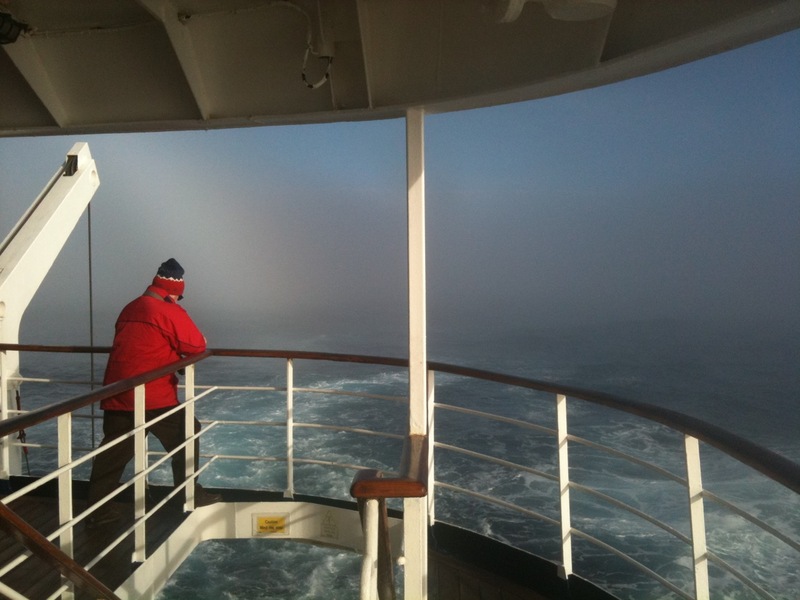 We are crossing the Drake Passage returning to Ushuaia. 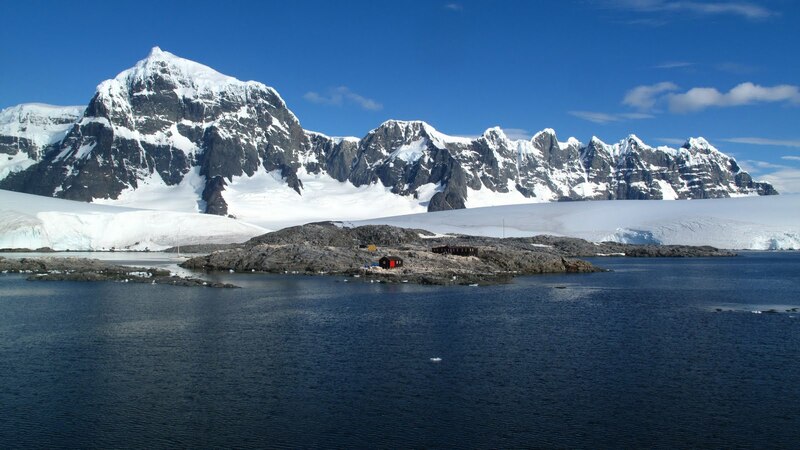 The last Antarctic land seen was mountainous Smith Island on our left. We are having a "rough Drake." Winds up to 45 knots, which is 50 mph, waves steady at 7 meters (23 feet) and up to 9 meters (30 feet). The stabilizers make a huge difference. While on the bridge, the first mate told me he had worked on the MS Explorer in past years (famous because it sank to the bottom in 2007) and it would tilt 30 degrees to each side - far, far worse than we are enduring. And while there I saw a wave send water, not spray, but water, in front of the bridge windows and it's on the 5th deck! 9 meters for sure. It's difficult to walk. A few people have fallen. Some people aren't being seen much: Dramamine makes you sleepy and if sick the best thing you can do is lie down and close your eyes. I am surprised the cabins don't have more places to grab on; there are places something could easily be placed. They schedule these days at sea busy with talks and movies and a few breaks. Trevor Potts is staff on our cruise. 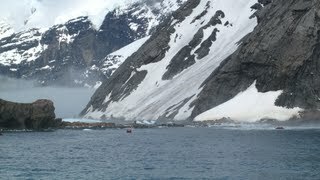 A Brit who had his 60th birthday this week, about 15 years ago he replicated Ernest Shackleton's famous voyage from Elephant Island - our first almost landing - to South Georgia Island, 800 miles, plus crossing the island over glaciers and up thousands of feet. Potts built a semi-replica of the James Card - 23 feet with sails and oars, but no motor. It was the same size and power, but not a replica in that it had a deck to keep out the weather; the original was an open life boat that they put canvas over. 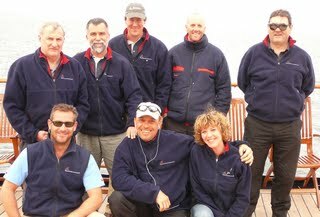 It was great to get the first-person account of 12 hard days at sea with one of crew of four useless. Someone, maybe a sponsor, asked him to repeat the trip a few years later, but he was not interested, "you can use my boat, but I don't want to go." Great story and to hear it first hand. They are showing "Life in the Freezer" one 30-minute program at a time; it's excellent. And expedition leader John Frick read Samuel Coleridge's Rime of the Ancient Mariner. John gave some background, but it was still hard to take in. 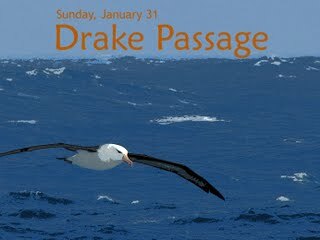 We have one more day at sea with the albatrosses and petrels, then arrive in Ushuaia early the morning of the following day. The photos are by Corinthina II staff. The Moon is backward south of the equator, so this should be sunrise. On bridge: just a bit of ice here and there - no problem. Legislature killed public disclosure on tax increases. Gregoire? "Two pages shall be provided in the general election voters' pamphlet for each measure for an advisory vote of the people under RCW 43.135.041 and shall consist of the serial number assigned by the secretary of state under RCW 29A.72.040, the short description formulated by the attorney general under RCW 29A.72.283, the tax increase's most up-to-date ten-year cost projection, including a year-by-year breakdown, by the office of financial management under RCW 43.135.031, and the names of the legislators, and their contact information, and how they voted on the increase upon final passage so they can provide information to, and answer questions from, the public. For the purposes of this subsection, 'names of legislators, and their contact information' includes each legislator's position (senator or representative), first name, last name, party affiliation (for example, Democrat or Republican), city or town they live in, office phone number, and office e-mail address. SB 6130 killed this transparency requirement; it didn't repeal that section, but provides an end run around it for two years. I am shocked that our legislature would want to hide when passing tax increases. They are going around right now saying it is their solemn duty to raise taxes. Aren't they proud of their responsible actions? Why hide disclosure of what they did? Christine Gregoire can stop the legislature in its tracks by using her line-item veto to remove the provisions that end-run the transparency provision of RCW 29A.32.070. Surely she is in favor of our legislators being responsible for their actions. Source: WA Policy Institute on 2/10/10 and 2/17/10. Sunny morning. 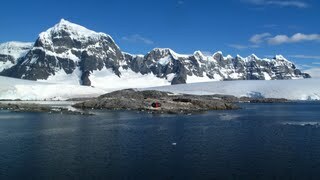 We arrived at Hannah Point on Livingston Island farther north in the South Shetland Islands. The crane for launching the zodiacs broke, so they used the older, slower one. I was expecting "yet another penguin rookery," but this is a great spot. I am glad they saved it for our last day. 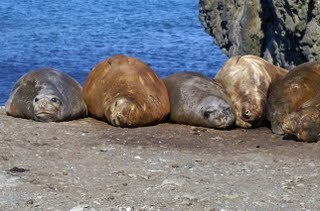 There are at least 40 elephant seals - huge, various shades of color from cream to reddish brown to darker brown and bluish. The males come south to molt both fur and skin; the females remain north. They don't enter the sea or eat until done molting in five to six weeks. They lie around and make gross noises and emit gross smells; must be teenagers Two fur seal were play fighting on a low ridge near our landing. Chinstrap and gentoo penguins nest here and blue-eyed shags also. 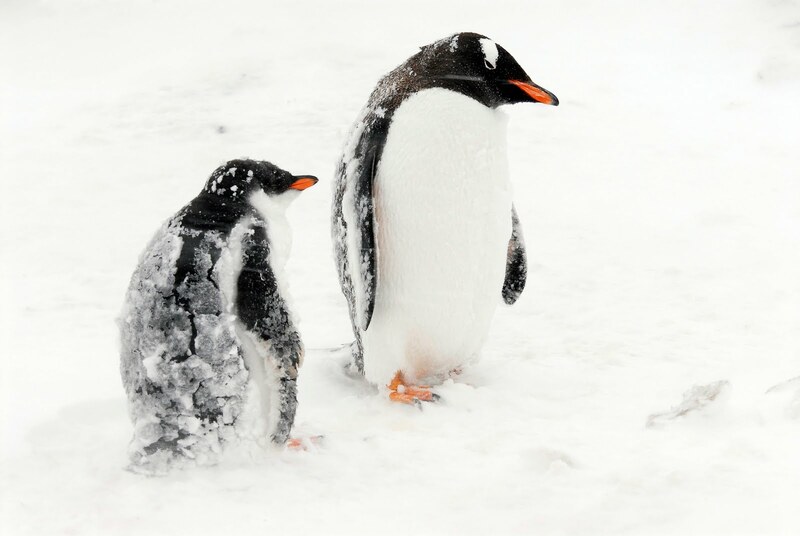 There are two pairs of macaroni penguins; they only ones we have seen on the trip. We hiked the step above the beach about a half mile west to a spot where there is an impromptu outdoor collection of fossils - all plants that I saw. We stayed away from all the elephant seals except one on our path. Just as I passed him he headed for the beach. The woman behind me got shouted at, because instead of getting out of the way she picked up her camera and stayed put - risky! Deception Island - Whaler's Cove. This island is the top of a volcano and is the perfect harbor because it is a circle with one opening. It made the perfect shore station for whalers one hundred years ago. There are several relics of their activity - old rusting huge tanks, derelict buildings, smaller industrial tanks and tubes. Derelict hangar next to the former landing strip. It was buried by several feet of volcanic cinders by eruptions in 1967 and 1969. There was a scientific station until that second eruption. I noticed the cinders on the glaciers on the north side of the island as we approached. A dozen brave people wore their swimsuits and went in the water. Surprise, right at the water's edge volcanic activity warms the sand. So they dig a hole so the sea water can be warmed and it's not bad. I was intending to join the group, but yesterday they showed us photos of people in their swimsuits freezing while they madly dig for warmth "and some don't find it." I was ready for a sure thing, not maybe. But Gini and daughter Margaret did join in. Not much wildlife here. Three pairs of gentoos. People who hiked to The Window to the east saw fur seals and elephant seals. I think some saw some kind of whales offshore also. I noticed Wilson's storm petrels which fly like swallows. The photos are by Corinthian II staff: Elephant seals. 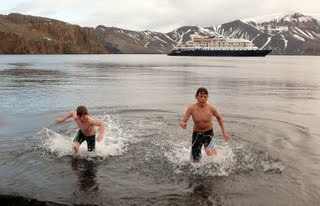 Two fine young men made this cruise a lot more interesting, Sam, age 14, and Luke, age 10. 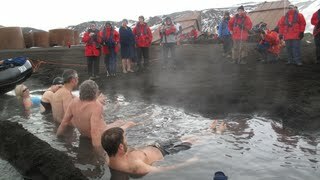 Other brave souls in the hot/cold water. 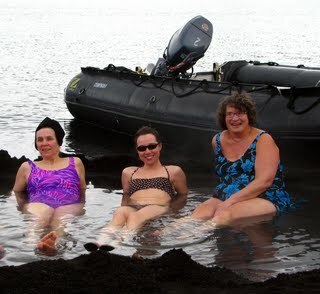 Last pic: Nancy from Seattle, daughter Margaret and wife Gini. Click to enlarge. Another night we hardly moved. 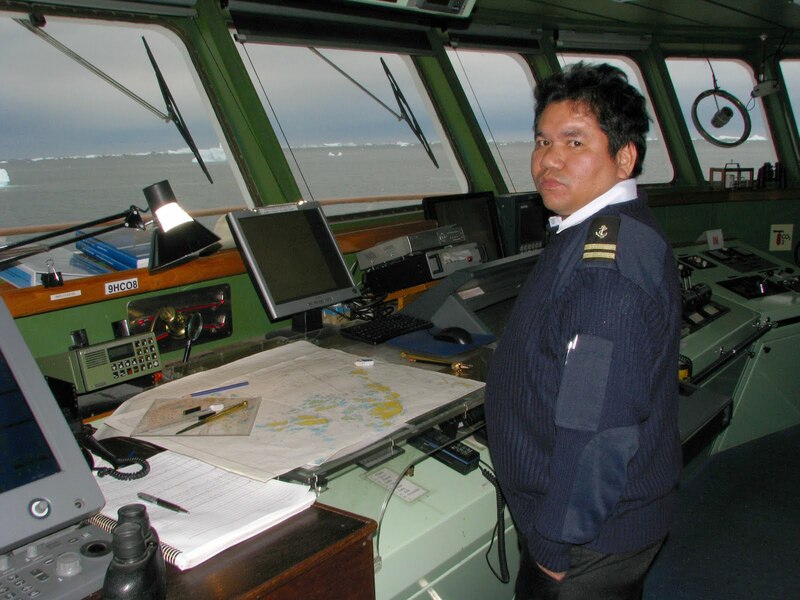 They didn't anchor to make it easy to move the ship if necessary to avoid ice "without waking the crew." I saw humpback whales at 7 a.m. and penguins in the water. When penguins swim they porpoise - leap out of water then back in. When they are near the ship it is clear they are going somewhere, but when they are farther away it looks like they are dancing for joy! At 3 am we saw the lights of a passing ship. 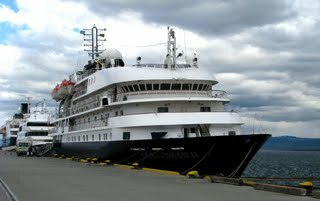 On our way to our first stop we passed Akademik Ioffe, a Russian arctic ship now in tourist service. Our crew tell us these Russian ships are very sea worthy, but have very basic accommodations, a far cry from our 5-star rooms and meals. We turned back to the south and landed at Petermann Island. Gentoo penguins - lots of them - and blue-eyed shags, which are cormorants that are stark black and white, like penguins, but they have a long neck. The shag parents were feeding their chicks. Very strange. When a penguin feeds the parent opens their mouth and the chick reaches up and grabs something. It's not so easy for shags: the chick his head in the parent's mouth and keeps pushing. You can actually see the chick's beak pushing out at the back of the parent's neck. Sun! Sun! Bright blue sky. We walked up and over to the far (north or west, I think) side of the island. Some marine mammal was close to shore. Beautiful. 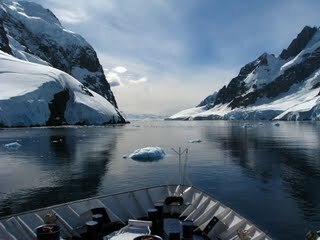 Just before lunch we passed through Lemaire Channel. Outstanding. A highlight of the trip. I was on the bridge as we approached and watched Captain Boczak and crew wind through some "bergy bits," which are ice bergs less than 5 meters high. He can brush them lightly, but must be aware of their underwater contours. Then I went to the top deck to take in the view on both sides. I would have missed lunch for this - good looking mountains close on both sides on a perfect day. After lunch we landed at Port Lockroy, don't recall the name of the island. It has the world's "southern-most post office." They may have the post office, but not the service. I saw them give our crew a bag of mail to take to Port Stanley in the Falkland Islands to put it in the British mail system. Their stamps say "British Antarctic Territory." The station is a seasonal gift shop, the post office and small museum run by four women here for the summer season. The gentoos are everywhere! Under foot! No 5-meter-separation rule can be enforced here. A historic quonset hut is being restored, actually replicated in wood framing, by David Attenborough who did the Life in the Freezer series for BBC. I just learned that he was also the moving force behind getting dogs outlawed and removed from Antarctica. We also went to the adjacent island. 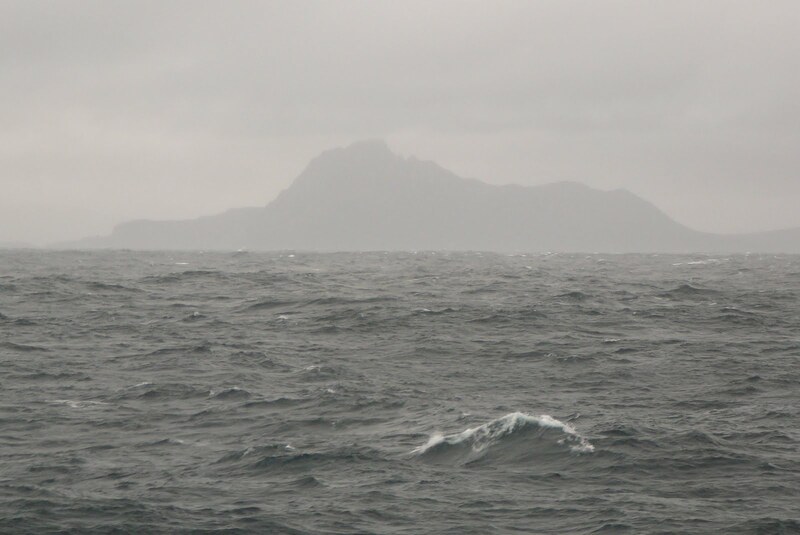 (These two islands are next to Wiencke Island.) More blue-eyed shags and an outdoor whale bone "museum." It's just an impromptu arrangement of whale bones - one sculpture and one mongrel skeleton made of mismatched bones, but it's instructive nevertheless to see how huge the animals are. 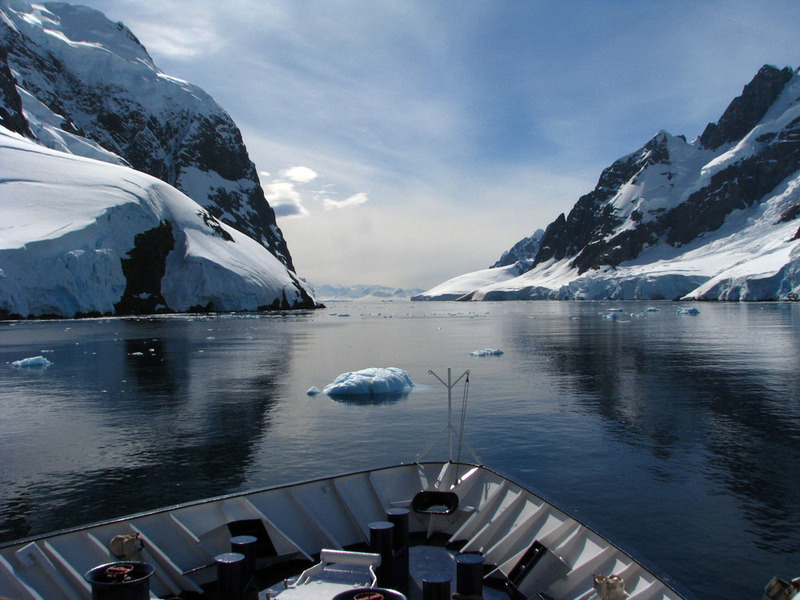 At happy hour time we transited Neumayer Channel - another good one, especially in the low afternoon light of these sunny day. (But I haven't seen one as good as Lemaire.) The photos are by Corinthian II staff: Lemaire Channel. The captain called this "ice free." Port Lockroy: quonset hut being rebuilt on the left; an old building not being used front and center; the gift shop/museum building on the right. Click to enlarge. Position at sunrise 65 15 S, 64 16 W. Temp 1 C. This is the farthest south we traveled. Tourists generally don't go south of here. Surprising, since the Antarctic Circle is less than one hundred miles. But from what I hear, as you go south ice is more and more of a problem, but the scenery is less interesting, so people don't find it worth the time and effort. 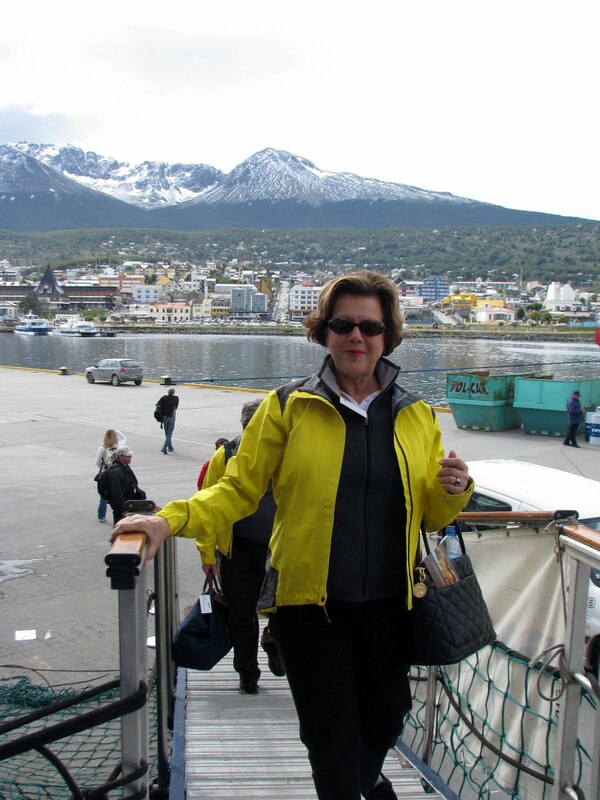 In the Argentine Islands. It's warmer again with a little sun in the morning. Vernadsky Station (Wikipedia) is the Ukraine scientific station. We were hosted for a tour; rather perfunctory; they are scientists, not tour guides. Their accommodations are decent - looks OK when the weather allows going outside, but during the dark, wild winter it would get pretty small. This was a British base, but they surpluses it and sold it for one pound sterling. The Ukrainians took it over and maintained the continuity of the weather and ozone-hole observations. They have a souvenir shop and a bar! On an adjacent island Wordie House is an abandoned, yet maintained, British station. It is maintained as it was in the 1940s - very small and cramped. I could not imagine spending more than an overnight there, let alone a long, dark Antarctic winter. On the ship they cooked bar-b-que outside and we ate outside and hosted the Ukrainians. In the afternoon we went a few miles to Pleneau Island. 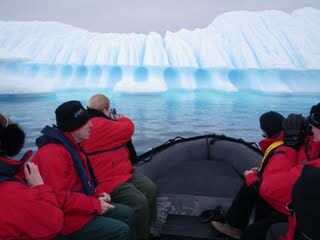 It is a shallower area with dozens of beached ice bergs. Being beached it is safe to observe them closely (if not it is very dangerous because a berg can rotate at any time). After they melt and get smaller they float off. We did a zodiac tour around them. We saw four leopard seals, one of which was on a berg; two of them put on a show for us; another passenger got dynamite close-ups of the open mouth with fangs. Several crabeater seals were hauled out. Other people saw humpback whales today. None of us it getting tired of seeing yet another ice berg. Every one is different. We will stay in this area another day because there are high winds to the NE and it's nearly calm here. The photos are by Corinthian II crew/staff. 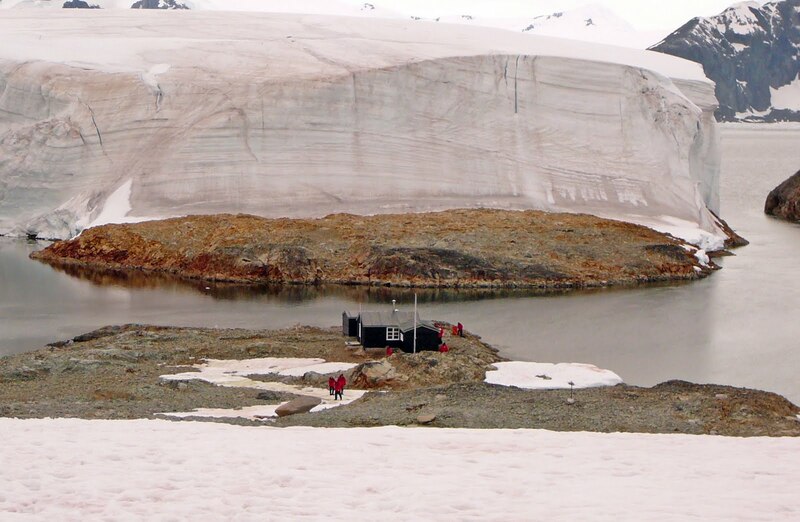 Wordie House is overwhelmed by a sea-level glacier on flat ground; not an unusual site at all. Yet another ice berg. It is shows clearly that it has melted from above, so its sea-level line has shifted upward. President Obama promised that his stimulus bill would "create or save" many jobs. Did he make it perfectly clear that he would create dependency on the government? That he would create government jobs while allowing the private sector to languish? When the White House first announced its great job gains the data were found to contain egregious errors - jobs that had not yet started; fictional congressional districts; double counting. After one year here is the snapshot. Lots of new government jobs - 2 per cent more - but far fewer private sector jobs - minus 7 per cent. And the money involved. OK. I am one day late and three more days for Lincoln's actual birthday. From PowerlineBlog As a politician and as president, Lincoln was a profound student of the Constitution and constitutional history. Perhaps most important, Lincoln was America's indispensable teacher of the moral ground of political freedom at the exact moment when the country was on the threshold of abandoning what he called its "ancient faith" that all men are created equal. In 1858 Lincoln attained national prominence in the Republican Party as the result of the contest for the Senate seat held by Stephen Douglas. It was Lincoln's losing campaign against Douglas that made him a figure of sufficient prominence that he could be the party's 1860 presidential nominee. At the convention of the Illinois Republican Party in June, Lincoln was the unanimous choice to run against Douglas. After making him its nominee late on the afternoon of June 16, the entire convention returned that evening to hear Lincoln speak. Accepting the convention's nomination, Lincoln gave one of the most incendiary speeches in American history. Lincoln electrified the convention, asserting that the institution of slavery had made the United States "a house divided against itself." Slavery would either be extirpated or become lawful nationwide, Lincoln predicted, provocatively quoting scriptural authority to the effect that "a house divided against itself cannot stand." Demonstrating how it "changed the course of history," Harry Jaffa calls it "[t]he speech that changed the world." On July 9 Douglas responded in a campaign speech to a raucous throng from the balcony of the Tremont Hotel in Chicago. Lincoln was in the audience when Douglas prepared to speak and invited Lincoln to sit on the balcony. In his speech Douglas rang the themes of the momentous campaign that Lincoln and Douglas waged that summer and fall for Douglas's Senate seat. Douglas paid tribute to Lincoln as a "kind, amiable, and intelligent gentleman, a good citizen and an honorable opponent," but expressed his disagreement with Lincoln's June 16 speech to the Illinois Republican convention that had named him its candidate for Douglas's seat. According to Douglas, Lincoln's assertion that the nation could not exist "half slave and half free" was inconsistent with the "diversity" in domestic institutions that was "the great safeguard of our liberties." Then as now, "diversity" was a shibboleth hiding an evil institution that could not be defended on its own terms. Douglas responded to Lincoln's condemnation of the Supreme Court's Dred Scott decision -- a condemnation that was the centerpiece of Lincoln's convention speech. "I am free to say to you," Douglas said, "that in my opinion this government of ours is founded on the white basis. It was made by the white man, for the benefit of the white man, to be administered by white men, in such manner as they should determine." Lincoln invited Douglas's audience to return the next evening for his reply to Douglas's speech. Lincoln's speech of July 10 concludes with an explanation of the meaning of the American creed with matchless eloquence and insight, in words that remain as relevant now as then. We are now a mighty nation, we are thirty---or about thirty millions of people, and we own and inhabit about one-fifteenth part of the dry land of the whole earth. We run our memory back over the pages of history for about eighty-two years and we discover that we were then a very small people in point of numbers, vastly inferior to what we are now, with a vastly less extent of country,---with vastly less of everything we deem desirable among men,---we look upon the change as exceedingly advantageous to us and to our posterity, and we fix upon something that happened away back, as in some way or other being connected with this rise of prosperity. We find a race of men living in that day whom we claim as our fathers and grandfathers; they were iron men, they fought for the principle that they were contending for; and we understood that by what they then did it has followed that the degree of prosperity that we now enjoy has come to us. We hold this annual celebration to remind ourselves of all the good done in this process of time of how it was done and who did it, and how we are historically connected with it; and we go from these [Independence Day] meetings in better humor with ourselves---we feel more attached the one to the other, and more firmly bound to the country we inhabit. In every way we are better men in the age, and race, and country in which we live for these celebrations. But after we have done all this we have not yet reached the whole. Feb. 2 Brown's Bluff and Joinville Island We passed the end of the Antarctic Peninsila to pass between it and some islands, bound for Paulet Island farther south. The area we are passing called Iceberg Alley and deserves the name - monster after monster. But the report at Paulet is for Southerly winds at 35 knots and it's totally exposed. Not a fit for tourists like us. 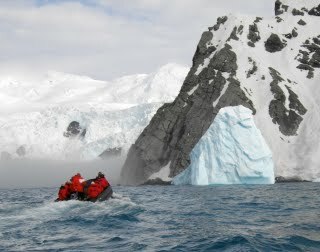 So we turn first to the day's second destination - Brown Bluff on the Antarctic mainland - bluffs up to 750 m or 2300 feet. Brown skuas and cape petrels were around at we got to shore. We went ashore with good boat landing and entry. In snow blown by 20 to 30 mph winds we walked the beach. Gentoos nest low, while Adelies make a heroic climb to where the rocks are first cleared of snow. We were satisfied by a 30-minute walk in the wind-driven snow. Back on the ship for lunch and repositioning we saw a pod of about a dozen orcas (They are now regarded as the largest dolphin, not a whale.) This population varies from our North Pacific variety by being smaller. They also carry a green tinge on their coat, but that's a parasite, not genetic. In the afternoon to Kennis Bay on Joinville Island; it has a bay facing west which is good for the southerly wind. Before going ashore the conditions look even stormier than this morning. But on the water and on shore it not as bad. Land on rock ledges, but not slippery and we had to scramble over some snow. As we approached the shore in the zodiac a leopard seal was in the water very close! A couple hundred gentoos down low. Thousands of Adelies nest above. Some are 200, 300, even 400 feet above the sea. This landing was more pleasant, since it had less wind. Dr. Earl Palmer of National Presbyterian Church spoke on The Meaning of Freedom. 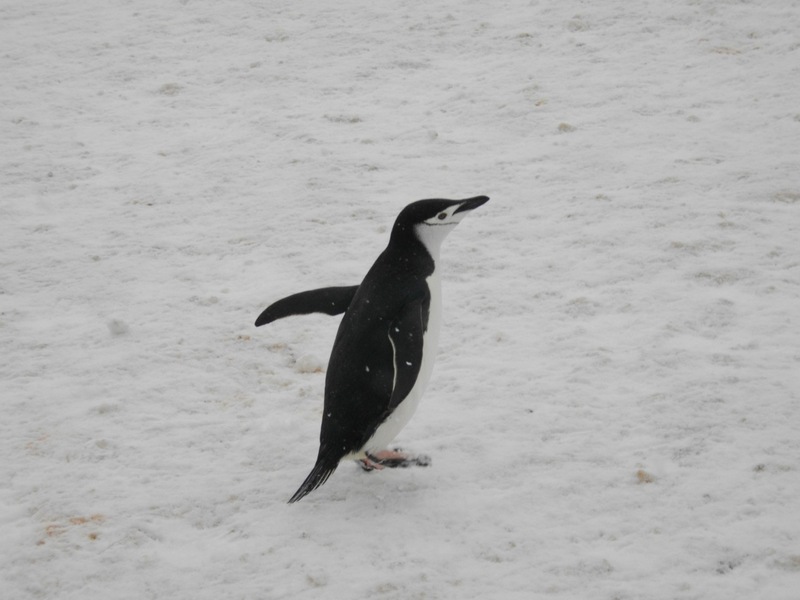 Photos both take at Brown's Bluff by Corinthian II crew/staff and myself: Chinstrap penguin. Gentoo penguin adult and chick in the snowstorm. That's us, Gini with her fur lined hood, me behind with my Icelandic wool hat under my hood. The seas, though rough enough to make some people sick and all to use Dramamine or a patch, were better than average, so we made good time. 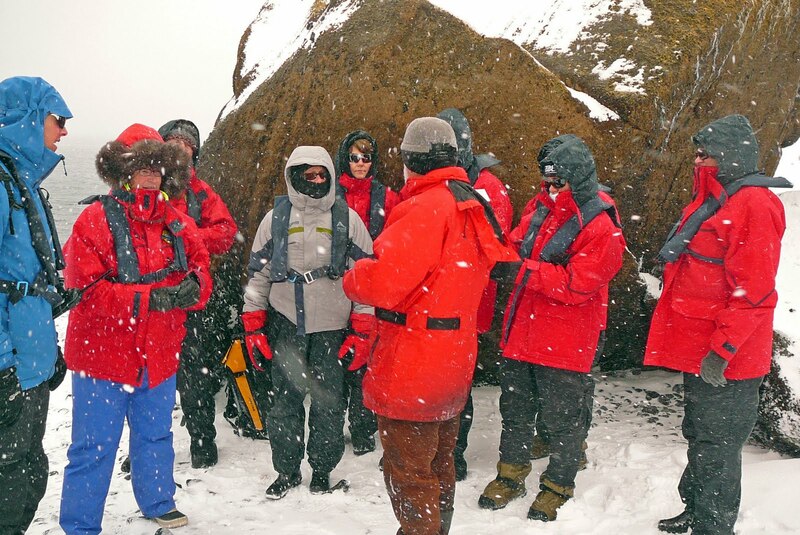 We arrived on the north shore of Elephant Island at Point Wild where Shakelton's crew waited months for his trip to South Georgia Island and back to rescue them; we had time for a landing. 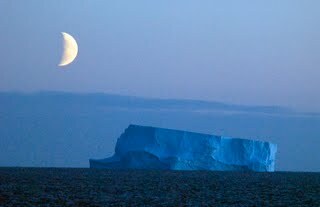 It is to the northeast of the Antarctic Peninsula, the last spot before hundreds of miles of ocean to the north. 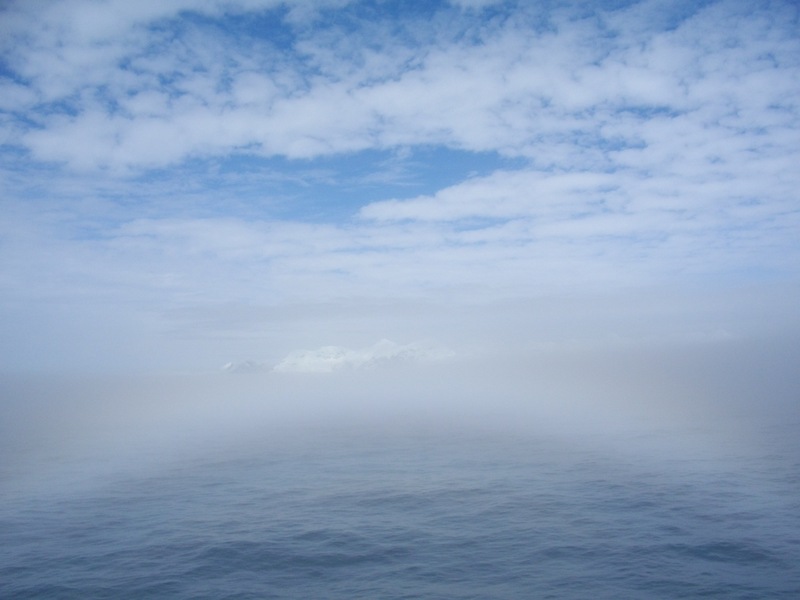 We approached in fog, then it suddenly opened up after we were close. The first view of penguins for most of us (a few saw them swimming - porpoising) was 100 or so of them lined up on an ice berg. There is not enough room to land 100 people, so we did a zodiac ride. Rough entry from ship to the boats. There are lots of penguins - chinstraps - and a few Antarctic fur seals. Pale-faced sheathbills are standing among the penguins waiting for something to steal, like pieces of fish dropped in feeding the chick from the mother's mouth (and stomach). 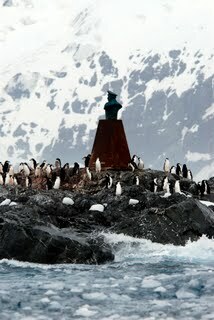 A monument to the Chilean captain who commanded the ship rescuing Shakelton's men is easily seen. Our favorite: a lone chinstrap penguin on a 50-foot long ice berg - king of his ice mountain. 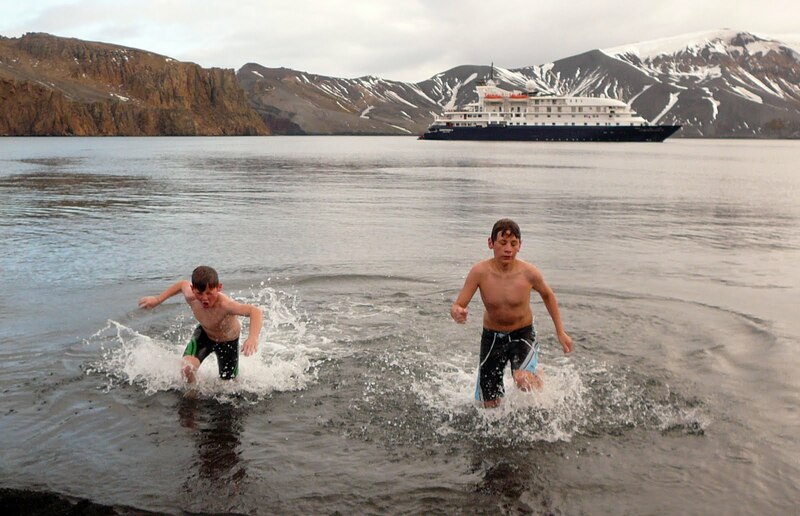 Our ship's crew tell us that they don't get to stop at Elephant Island, but about one trip out of three or four. Earlier in the day staff Ken Wright, the bird guy, spoke on penguins and Prof. Ed Spencer of Washington and Lee University spoke on Wind and Waves. Photos by Corinthian II staff and me. Our first view of Antarctica, through the fog! 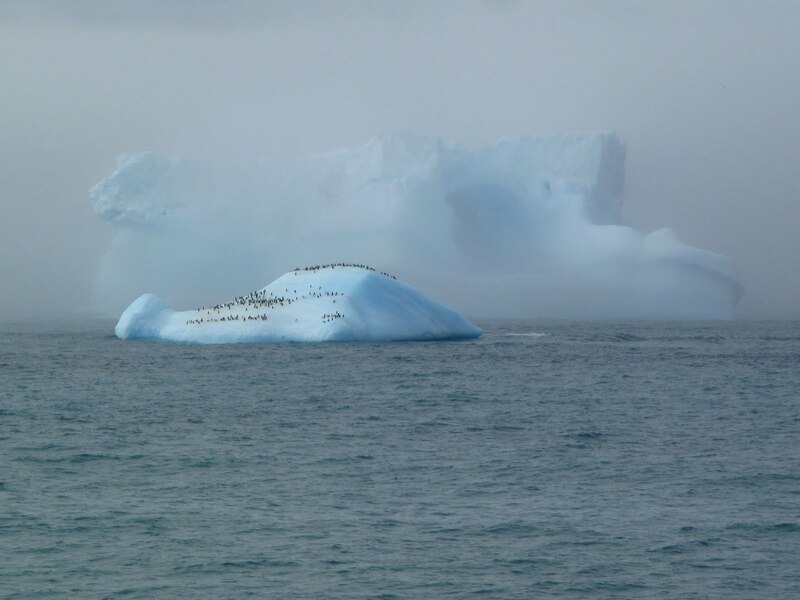 That ice berg is packed with penguins, the first seen out of the water. And note the much larger iceberg in the fog in the background. Note the red parkas - a zodiac packed with ten travelers and one boat driver. The monument on Point Wild to the Chilean who captained the rescue ship, surrounded by chinstrap penguins. Click to enlarge. This morning is a "very great Drake." 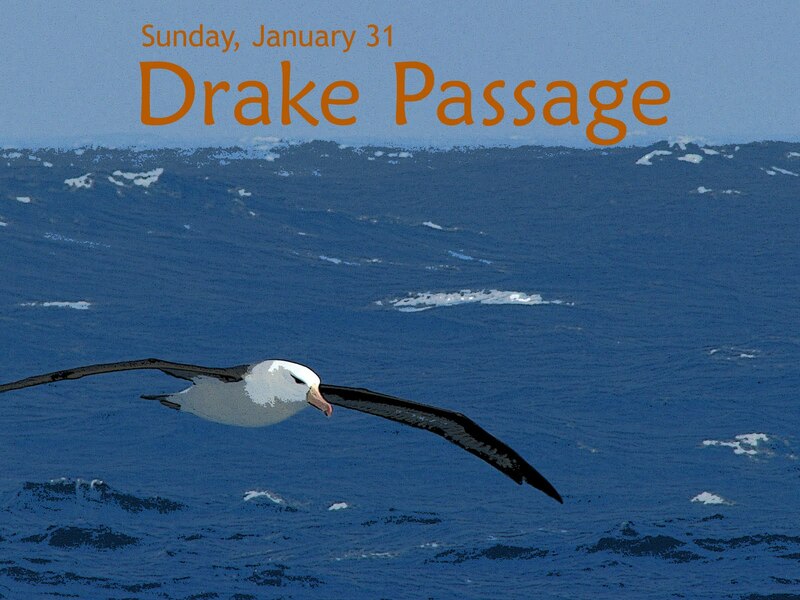 The Drake Passage is 550 miles across Southern Ocean to South Shetland Islands of Antarctica. We had rolling waves, avg. speed 14 knots. Not quite "Drake Lake" but better than usual. The Antarctic Convergence is the actual start of Antarctica. It is where you meet a mass of cold water 5.4 - degrees colder - from melting glaciers; it's often foggy at the line. Colder water means more nutrients and great increase in sea life. We crossed at 4 am. 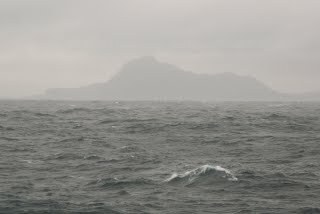 If our progress remains good we will have time, conditions permitting, to stop at Elephant Island tomorrow. Albatrosses are following our ship, as we expected. Ken of the tour staff is the ornithologist. Wandering albatrosses have very straight wings up to 120 to 140 inch wingspan (10 to 12 feet!). They get whiter as they get older. Those I can identify, but Ken sees much more - several kinds of petrels and prions. Also black-browed albatrosses that have markings by their eyes that make them look very serious all the time. The albatrosses never flap their wings - always soar, even at wave height. They spend months at sea, sometimes resting on the water. They only go ashore to breed and raise the young. Position at noon: 60 S, 63 W In the later afternoon Dr. Earl Palmer of National Presbyterian Church in Washington, D.C., spoke on The Good Design of Creation. Graphic and ship photo by Corinthian II crew/staff. A black-browed albatross. A passage morning with snow - my photo. Obama has finally realized that he can't borrow an infinite amount of money. He has to cut something. But the unions own him; they won't allow freezing pay levels just because people in industry are losing their jobs. He is busy pushing food stamps and other welfare programs on anyone and everyone. Cut spening? "Can't. Too busy increasing it." Where can he cut? On defending you - one of the few essential programs of the federal government. Our US Constitution allows the national government to do a very limited list of things and the states to do anything. Defending our borders is on that short list. Obama, excuse me, President Obama took the oath of office to defend the Constitution. Well, he seems to find it inconvenient. Where can he cut? He is lining up the pins to cut our defense while throwing billions at his buddies. The Quadrenniel Defense Review (QDR) is a review done by the Defense Department every four years to set its priorities. It goes through all the threats and our ability to counter them, then sets the direction we must take to be ready for the next years in the future. It is the opportunity to correct course for our defense. Obama's generals and admirals did the work for him. They see no threat in radical Islam. Bombing an aircraft with 300 people over Detroit by a member of a radical cell in Yemen? That's a police issue for Obama. They see no threat in Iran. Obama is going to talk with them without conditions. Well, he already tried that and ... Pay no attention to how the situation got worse instead of better. The threat? Global Warming. No, call it Climate Change. The QDR report is only 128 pages and 8 of them are about defending our borders from Climate Change. Using our defense dollars. In the hands of a Chicago machine boss the QDR is one more exercise in rewarding friends and punishing enemies. Who cares about defending the people he promised to defend? This is stranger than fiction. Via James Corum of Baltic Defense College in Estonia writing at Telegraph (U.K.). I kept a log book during our 10-day cruise. I am going to post my daily entries one at a time, probably once a day. 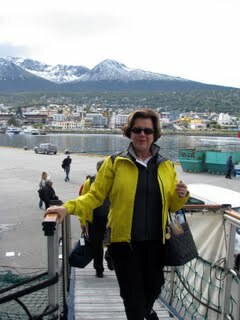 We begin: January 30 We stayed at Los Acebos Hotel half-way up a mountain above Ushuaia, Argentina on Tierra del Fuego Island. The ship we were scheduled on was damaged and put out of service just after Christmas. Multiple cruises were canceled. 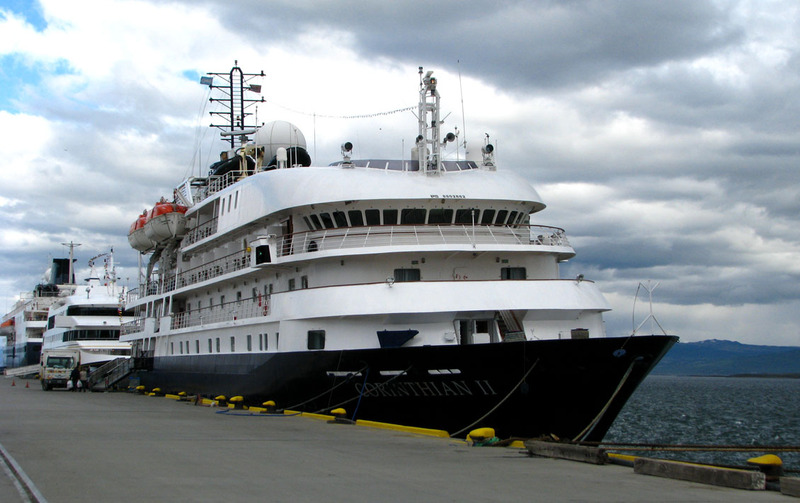 Luckily our group fit on the Jan. 30 departure of Corinthian II, which was two days later. We kept our departure date from home the same and spent the two extra days at Ushuaia, hosted by Travel Dynamics the company that operates these ships. 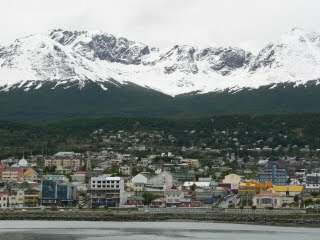 Ushuaia is like one of the city/towns in the panhandle of SE Alaska - glaciers above, steep streets climbing one block from the water, shortage of land. And snow in summer at the level of our hotel a ten-minute drive above the city. It has outdoor-supply stores for hiking, climbing, kayaking, etc. and tourist trinket shops. 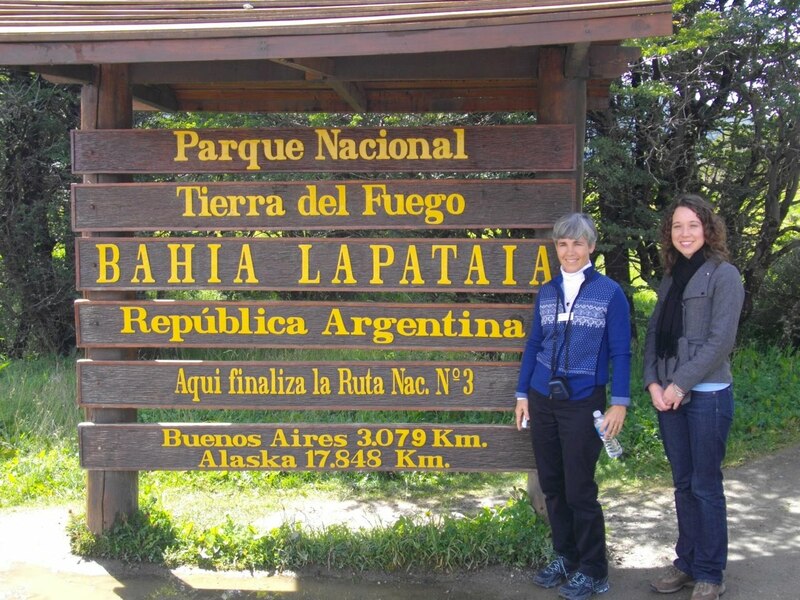 TD hosted us on a half-day tour of Tierra del Fuego National Park, just west of town. It has lots of good-looking mountains and the end of the PanAmerican highway that goes from Alaska to "Fen del Mundo" in Argentina. "But Chile is farther south," you say. True, but no highway there. And it is broken by the Darien Gap in Panama. I am amused that the last few miles of this famous highway here is gravel! They had better pave this section before word gets out! We were to get on the ship at 3 pm. But they delayed us until 4 pm due to late-arriving passengers. Departing at 8 pm, an hour before sunset, we traveled east in the Beagle Channel. Viewing was poor, due to low light and low ceiling of clouds. We saw lights on the Chile side that I presumed to be Puerto Williams, Chile, the southern-most town in the world. (Neighborly fighting: Argentina is doing what they can to prevent development there and its promotion to a city which would take the crown from Ushuaia. 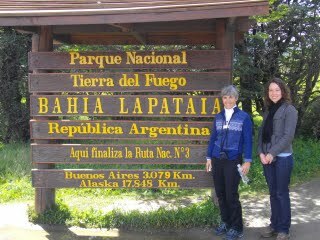 The photos, first by me:Barbara from Dallas and Margaret at the end of the PanAmerican Highway from Alaska. 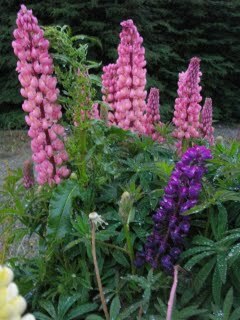 Lots of lupines. 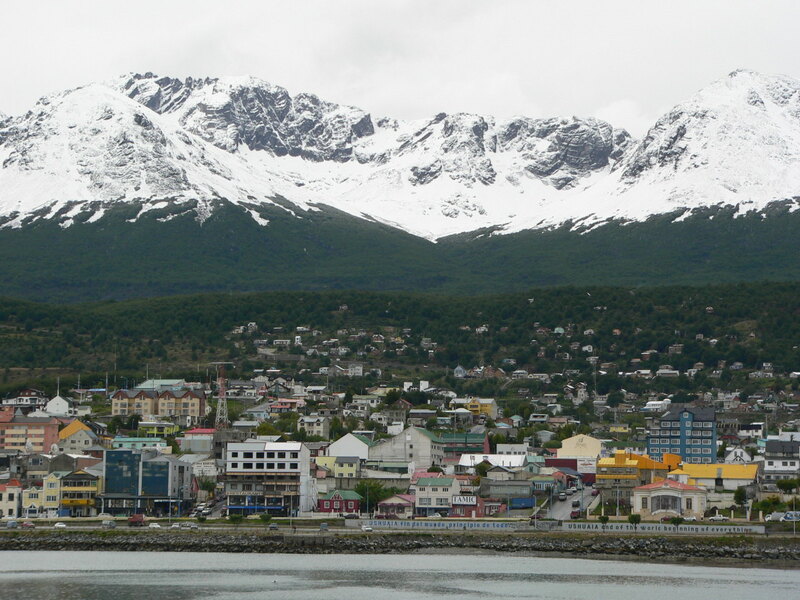 Ushuaia with fresh snow in summer and typical overcast. Unidentified cotraveler boarding, taken by Corinthian II crew/staff. Click to enlarge. Got off ship and to Buenos Aires for one night. Wow! Ten days at sea. Five at the continent and its islands. Glaciers by the hundred. Massive ones. Penguins. Everwhere. Seals of five varieties. On shore nine times plus two zodiak only. Ruth age 82 went ashore. More after we get home Friday. Access at sea was expensive ana spotty.